Jenson's problem was not that he needed to drive like Lewis. and if that were the case then he and his engineer's wouldn't have looked at Lewis' data but would have looked at his Telemetry to "teach" Jenson how to drive. now i don't think anyone thinks that is the case. Data is how the car behaves and is set up telemtry is how the driver behaves and controls the car. Here is my take on the story; Jenson was doing fine till around Bahrian (won Australia, 2nd China, Malasyia was ahead of Lewis till his error with Karthikeyan and even Bahrain was ahead till he got a puncture, exhaust and diff failure). anyhow, after that point Mclaren introduced a major upgrade after Mugello (including a higher nose as well as other aero fiddles) Jenson and his engineers struggled to adapt to that and get heat in the tyres, or maybe they thought they can get more of it, who knows. They changed a few things with the aero, mechanical balance as well as suspension geometry which they thought would make them faster. It didn't. the effect was the tyres were overheated and lasted nearly half their expected time and thus Jenson had to go very slow or have extra pitstops. Got to Monaco changed things a bit, things got a bit better but Jenson couldn't get out of Q2, made a bad start and this being Monaco and his car not being handicapped he couldn't pass Kovalinen even though he was faster and strategy didn't help either. Canada was the absolute shocker, Jenson's car had a problem and he couldn't even drive it properly, in practice he did many out and in laps to test the car is working but clearly something was wrong with his gearbox IRC. the team decided that since he already had problems with the suspension they would use the opportunity to test out a new rear suspension which they thought would make things better. the car's rear end got a makeover by P3 and Jenson was out, did a few edits to setup with the limited time available and he and the team went nearly blind to Qualy and the race which was disastrous for the 2011 winner. even getting lapped by Lewis, and whatever your opinion is i doubt people really think that Lewis can lap Jenson that easily and the gap between their race pace in clear air has never been more than a couple of tenths either way. By Valencia the team decided to go back to a base which they knew worker, and that would be their last major Upgrade after Mugello and since Jenson was struggling at that point they had to go with Lewis' setup given Jenson' and Lewis' setups are normally within 5% from each other (the team stated several times they set the car up a bit similar). they tuned to that base and Jenson got to test it out through practice, unfortunately though at this point Mclaren were the slowest of the front bunch, even Lewis who had gotten used to that upgrade swiftly struggled in Valencia and Britian as did Jenson but he was up to speed then. Well i'm not sure how much the drivers use one another's setup data and obviously in Spa Hamilton got it totally wrong but i guess this can happen from time to time. But this is much different to the problems Button was having, his driving style was preventing him from getting the performance out of the car that Hamilton was, plus he couldn't adapt his driving which Hamilton had done, the team basically had to make the car work for him which took several races to sort out. Big claims for someone looking in from the outside. Which are the big claims? Also it is the job of every team to make a car work for their driver, just as it is the driver's job to get the most out of what he is given. Drivers dont come in during practice to hop out and adjust their toe - they report how the car feels, and how they'd like it to. Its up to the engineers and designers to determine what adjustments should be done to accomplish that, the mechanics to implement the engineers' ideas, the driver to test the adjustment and report back on how the behavior changed, and the designers to make it easier over the course of the season. Some of the drivers are more involved with the engineering process than others, and they should all know the basic concept of "changing this causes this", but they are there primarily to give feedback. After they outsmarted themselfes they failed to see how they got it wrong, were to proud to look at Hamiltons side of the gerage, until McLaren pulled the plug & told Buttons side of the gerage to use Hamiltons set up as base , and learn from him about the tyres. In that case they were looking at Hamilton's telemetry as well then because they clearly were looking at the way Hamilton was using the tyres. I agree Button was dong fine until the major high nose upgrade, i don't remember the races in detail like you but Barcelona was another poor race for Button, as a layman its hard for me to understand how he got so far lost especially in races where his teammate was the quickest and you like you say their setups tend not to be that far apart anyways. Well its funny i've just been watching the Sky review of the season and Brundle said he believes that Hamilton is the fastest driver in F1 because he find a way to drive anything fast, but he did add he didn't believe Hamilton to be the most complete. JB struggled at Bahrain, too. Hamilton was only behind him after 2 slow pit stops, and was about to overtake Jenson as the latter hit a HRT. You are confusing Bahrain with Malasyia. Malasyia Jenson was ahead after the restart till he hit an HRT. Bahrain Jenson was ahead when he DNFd, Lewis had 2 slow pitstops and emerged a bit behind Button. Hamilton himself said he made an alteration to his driving in order to get better performance out of the tyres, he even added that perhaps other drivers were already doing this but didn't say what he was actually doing, why would he? Then we see the all the race engineers and Button looking through his telemetry/data to see exactly what Hamilton was doing, i just question given all this why Button could not replicate this thats all. I highly doubt that drivers change their styles exteremly, a driver uses a certain style or works up to it since his Karting days in his early teens. this is what makes him fast, of course some changes are made but they are simple and mostly design dictated for example "don't overlap throttle and brakes" " don't keep braking till the apex", but mostly things don't change radically and even with these minor changes drivers will mostly take the whole weekend to get used to it and find pace. Everyone has to adapt to the tires every year. In every team I've ever been involved with with multiple drivers, its standard to compare the telemetry. Who braked later, who got on the throttle sooner, who had less wheelspin, and where all that happened, etc. Jenson wouldn't even need to see telemetry to know what Lewis does differently - watching an onboard would tell him that. Drivers cant just copy each other's actions though, it has to feel good, and what feels good and is fast for one won't always feel good and be fast for another. I don't think Jenson's results at any point during the year were due to being unable to adapt to anything. I think in most of the races where there was an extreme difference in performance between the two drivers, there was an extreme difference between the two cars. For me, both drivers did a solid job this year, very few mistakes. That said, and getting back to the point of the thread really, I think at all but maybe 3 rounds at least ONE OF the McLarens had he pace to win, and that should have been enough to win a championship or two. But it was't, because of mistakes (pitstops, refueling), failures (roll bar, gearboxes), and risky decision making (race and qual strategies). I won't label the development path a mistake or poor decision because who knows what they gained from it. Prolonging Jenson's misery may have given them the info needed to develop parts that allowed both Jenson and Lewis to win later in the season. Or what they will apply to the 2013 car. What where the car differences at Monaco, Bahrain, Barcelona ? JB's problems, were he was not happy with the balance of the car, & he could not heat up the tyres. He had to adapt his driving style therfore, they needed Lewis data, to see how Hamilton did it. He said his issues with the Pirelli tyres had led to the team taking the wrong direction around Monaco. "I find [the tyres] very difficult to understand, that's why we tried a few new things this year in Canada and Monaco and places like that, because I felt I needed to find a bit more direction with the tyres, and what we tried definitely didn't work," Button said. "So we went back to what we had at the start of the year at Valencia, and that's when we started being more competitive in terms of me within the team being more competitive, not compared to Ferrari and Mercedes and Red Bull but compared to Lewis [Hamilton]." Button explained that keeping the Pirellis in the correct operating window had been his main issue, with his famously smooth style not always paying dividends. "Most of the problem this year has been in and out of the range where they work, and that's a difficulty," he said. "You try and drive gentle with them to look after them, and they drop out of the range and you end up damaging the tyre more than if you keep them in the range and are aggressive with the tyre. "It's been very difficult, especially for me, because my style of driving initially didn't suit the tyres - I've had to adapt a little bit." Errr...there are only so many ways to put energy into a tire, and none of them are a mystery to any F1 driver. In other words, there is no magic explanation in another driver's data. If you try everything and it doesn't work, there is a fundamental design problem in some aspect of the car. If its only happening on one car, there's probably something different about that car. I could give you some guesses about what development parts differed on the cars in those rounds, but we don't get to know the answers. Sometimes there's a story about a wing or a nose or something else that is easy for outsiders to see, but there are changes made constantly that we know nothing about. Even the tech guys who do their best to find and explain new things on the cars miss a lot of it. Nobody knew about RBR's secondary DRS use in Singapore really, for example, and that's a pretty big thing. Years from now an interview with Paddy Lowe might tell us McLaren was trying something crazy. Whether some worked it out because of skill or whether it was because the tyres worked better with their natural style so there was less changing needed, as far as we are concerned it's anyones guess. So say for one driver it might have only needed small changes. For another it might have needed huge changes. Who would work it out quicker? It was said by a number of people the tyres weren't behaving in the traditional manner. So again that threw a spanner in the works. Normally tyres are made to react in a certain way Pirelli due to the way the restricted testing etc built a tyre that didn't react normally. So there's a bit more to it than just simple replicating what the other guy is doing. If it was just a case of one driver Replicating the other Massa would just Replicate Alonso and Webber Vettel. Barring DNFs and accidents the cars would all cross the line Noah style. Of course that never happens. As for the engineers going through the data. Of course they are going to. They don't collect mountains of the stuff for nothing. They go through the data all the time. In Canada they were using pretty much the same set up I reckon from reading fairy cakes loads of articles and all the interviews. Polar opposite results for the tyres. So the best time to look at it. When they can look and see what is causing the problem on one car they can fix it. That also gives them info on how to reduce the problem further on the other OR indeed give them info on what not to do in future races. Back in the days of testing teams would purposefully put what would be considered a disreputable set up on a car to see what happens. Because although it's wrong you still learn from it. No testing means they don't have the time to do it these days. Not only did doing that help JB it would have helped the designers, Race engineers and the guys doing the software for the Sim. Which obviously in turn would help Lewis. Jenson never had a problem heating up the tires this year, it was over heating he suffered with. The setup issues Jenson had was all about balance, take Canada Jenson was over heating the rears and under heating the fronts with his setup. If you can't get the tires into there working range you wreck them in two or three laps, this is why in Canada Jenson was so shocking. Can't we just let this lie now? You're really going to say he ONLY overheated them directly below his own quote that says he couldn't keep heat in them? You said "Jenson never had a problem heating up the tires this year" directly after a quote was supplied in which Jenson said he couldn't keep enough heat in them without damaging them. That sounds like he couldn't heat them up to me. And I stand by that! Jenson had trouble keeping the tires in the working window. The window has two ends mate. He struggled with both overheating AND underheating. His problem according to Hembrey I think it was,was keeping both ends of the car in the window. IIRC he could get the rears to temp but the fronts were too cold. When the fronts were brought up to temp the rears overheated. It was Hembrey that said that JB had the biggest temp difference between axles of all the drivers. Don't think it will get better with more aggressive tyres that Pirelli are threatening to bring in '13. The tyre lottery and DRS are what is plaguing f1, apart from Bernie that is. take Canada Jenson was over heating the rears and under heating the fronts with his setup. I believe Pirelli bringing more aggressive tires with a wider operating window, so they might be better. But it might because the operating temp window is supposedly wider. Making it easier to keep both ends in the window. Plus Macca already had a handle on it anyway. 2012 tyres have been quite tricky, as you said, the problem was to get all 4 tyres at the same time into the same operation temperature. This is where Button struggled, rear tyres were heating up quicker than the front . Hamilton found a a way to heat them up equally, therfore they needed his data, to find it out. Saying new tires will be "more aggressive" could mean a million things - do you mean you think they will grip better? degrade faster? heat up quickly? in which capacity do you mean? 2013 tires will be more user friendly. The operating window will be larger (making it easier to get into, and stay in it), and they will multitask better (brake and turn simultaneously, oh my! ), but degrade predictably more quickly. They want more stops, so they're making them easier for everyone to use, but making sure everyone will still have to change them often. They really hate those one-stoppers. Read this carefully, also from your post lol "Jenson never had a problem heating up the tires this year, it was over heating he suffered with." So Macca used their data to understand the tyres. Next year they will have two drivers. I guess they will look at one set of data to help them do stuff. 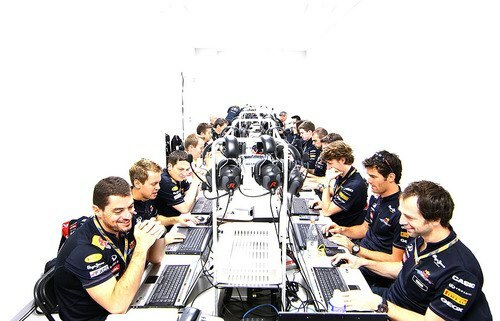 No doubt they have been looking at Hamiltons Data from Brazil free practice to help them in '13. It's no biggie to anyone but a Hamilton fan. Oversight on my part "Jenson never had a problem heating up the tires this year, it was over heating he suffered with most ." Everyone looks at everyone else's data within a team, all the time. Its standard. That's how they figure out what to do with the cars short and long term. Why do you think they have a million engineers collecting and analyzing the stuff? Its a TEAM effort. I don't understand where this "one had to use the other's info to figure out what to do" thing comes from - they all look at each other's info constantly, and everyone learns something from it one way or the other. Standard operating procedure. Now, only talk DOWN the table fellas, not ACROSS it, lest the dark side learn our data. Especially you, Gavin and Tim, you guys are the Data Engineers - no talking! Last edited by ashley313 on Tue Jan 01, 2013 9:33 pm, edited 2 times in total. Yep, Every driver suffered with them at some point, JB the most! Now, only talk DOWN the table fellas, not ACROSS it, lest the dark side learn our data. Thats an inaccurate characterization actually. There are temps at which a compound will work and temps where it won't, and thats regardless of wear. When you talk of "wear" there are different types - damage (blistering for example), and usage (you physically wear past the useful part of the tire's surface). Tires don't automatically wear away faster when they are hot. Don't confuse wear with temperature, they are their own independent issues. They used to they can't now. Gone are the days everything was hand written in a chart and handed over. When they used to write the wrong info. Everything is through computers and then through the chain of command. Remember Lewis old Race engineer is now over the top of the two race engineers. So info for both cars goes through one man as it goes up the ladder. Keeping stuff a secret between driver and RE would be a bit daft too. What happens if his RE is sick? the replacement doesn't know his foibles and his race is screwed. Heck for all we know, it was just the usual engineering Dept. post race debrief at Woking. It was just the first time Lewis had ever walked in on one and the first time he discovered what they did. IME (that's experience, not opinion) the guys who are there for both cars, meaning the designers, know everything that's going on with both cars. If they didn't, they'd never know how to develop the car. So there aren't really any super valuable secrets being guarded by one driver's engineers. They might not go advertising something they've found, but the data is always available to the other side to look for whatever they want.